I love talking about bridal makeup and skincare and it’s been a topic of conversation in the Mindful Bride Tribe Facebook group. Wedding wellbeing isn’t just about mindset, it’s about feeling your best and empowering yourself with knowledge in order to help you do that. That’s why I want to bring you more guest posts from experts who can help you. What’s your best tips for prepping skin in the lead up to the wedding? It’s important to remember that you’re probably not going to magically evade your skin type in the lead up to your wedding. Skincare can’t change you physiologically. If you have an issue with your skin that affects the way you feel it is worth booking a consultation with a dermatologist, or seeing your doctor first. But in terms of your Bridal Makeup and getting that to last all day hydration is the key for every skin type. Even oily skin! So my first focus for all brides, regardless of skin type is to drink water. And then look at your diet to make sure you’re getting a good range of vitamins. Then investing in an SPF is really important. This is actually the best anti-ageing cream! Protect your skin and prevent the damaging effects of the sun is key. It’s boring, but there’s no point in putting expensive lotions and potions on skin that you’re just not looking after properly. As a Bridal Makeup Artist, skin with any texture is our nemesis. On your wedding day we can go a long way in covering and concealing pigmentation, redness and scars, and temporarily mattifying oily skin but makeup won’t conceal lumps, bumps and dryness. It will only work to show it up. So it’s important to try and get to grips with your skin type and make it as smooth as possible for the day. Smooth skin is the perfect canvas for makeup. So while hydration is important, so is exfoliation. The first product I would recommend to all of my brides is Pixi Glow Tonic. In short, this is a low percentage acid that works to brighten, smooth and hydrate your skin. And you need to be using it for a few months prior to your day to reap the benefits. My second pick for every skin type is a Hyaluronic Acid. Hyaluronic Acid usually comes in serums. The best way to describe a serum is an intense or concentrated moisturiser that can penetrate deeper into the skin. Hyaluronic Acid acts quickly in plumping the skin and alleviating fine lines and wrinkles. So imagine the cumulative effects? One I have in my kit and mix with foundation is Estee Lauder’s Advanced Night Repair serum. As soon as you know you’re getting married, you should start thinking more seriously about your skin and the way you look after yourself. And to get your skin in good condition for your Bridal Makeup Trial is extremely important, just so you can get a better idea of how your makeup will be on the day. Would you recommend a face mask the morning of the wedding and if so, what type? I’d think twice about doing anything differently with your skin on the morning of your wedding. If you haven’t used a skincare product before then, avoid it. The last thing you want is to have a reaction or overload your skin, which will adversely affect the longevity of your makeup. From your Makeup Artists point of view your Bridal Makeup Trial isn’t for testing the skill of your Makeup Artist, it’s for testing your skin with the combination of products that they’re going to use. This all gets written down at your trial and they will ask for feedback on how the makeup wears and looks at different parts of the day. So introducing anything new on the morning of the wedding isn’t a great idea. If you want to use a face mask on the morning of your wedding, make sure you use the same one on the morning of your Bridal Makeup Trial. Like we’ve discussed above, hydration is the key to longevity. For certain skin types a primer might be a good idea to prep the skin particularly skin types that are oily (to help mattify), or have enlarged pores (to create smoothness). But your Bridal Makeup Artist will work with you at your trial to judge what’s best for your skin type. It’s also worth keeping in mind that lots of foundations are really intelligent, particularly those that are long-wearing- so often a primer can be an expensive and wasted step. Do you have any tips for those opting to do their own make-up? If you’re planning on doing your own makeup really question why. There’s not an issue or predicament that a Bridal Makeup Artist won’t have seen. We see women at their most vulnerable and we need you to expose your perceived flaws to us, so that we can work with you to create something that will work for you and that you’ll love. We have huge hearts, and are extremely empathetic – creating confidence is what our job is really about. If it’s down to budget, weigh up what the cost of your new products might be against the quote that you received. Good makeup isn’t cheap, and if you’re not much of a makeup wearer having lots of expensive products hanging around after the wedding is wasteful. But if you still want to go it alone, time and practice are the key to success. To create a Bridal Makeup look on the wedding day would take me an hour. I always factor in the distractions and the excitement, the drama and the chaos. There’s lots of stopping and starting and people to speak to, and organise. Like you would if you hired a Bridal Makeup Artist, trial the look your want to create with yourself. And do it for the time that you’re going to get married. 2pm is a popular time for a ceremony and 12am signals the end of the wedding day. Check if it can last that time frame. That makeup is also going to experience kisses, tears and humidity. To put it on and then take it off would be a mistake. Really go to town in your testing! Your hen-do might be a good time to try out your makeup skills. What would be your advice in terms of how to work with a make-up artist? As a Bridal Makeup Artist I’m interested in your boundaries. To explain what you want to your artist it’s best you create a Pinterest board of makeup looks that you can show to your Artist. It’s also a good idea to save pictures of when you felt you looked good, or how you’ve done your makeup for nights out. Having a strong idea of dislikes is just as good as likes sometimes. I also like to have access to an honest friend at your trial too! They will usually be able to tell me more about where your comfort zone lies. Doing all of this will give you clarity on the look you’re after. My nightmare as a bride telling me to do what I want. Trials I think are best around 6-8 weeks before the day. At this point your skin will be in good condition, far closer to what it’ll be like on the day itself. It’ll be closer to the season that you’re getting married in, and all of your other ‘bigger’ decisions will have been made. So you’ll be more certain about what you want from your makeup. 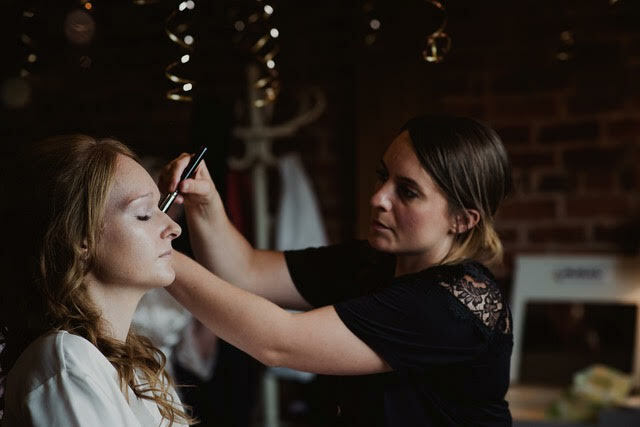 Having your hair and makeup trial on the same day is always a good idea, and if you’re really organised planning a dress fitting for later that same day can really help you bring your styling to life and put any anxiety to bed. Makeup Artists are just people, and they’re people pleasers. It might seem intimidating handing over control of your face to us, but it shouldn’t be. Find some artists to follow on social media and contact the ones that feel relatable to you. If you like them, and you’re comfortable in their company, that is more than half of the battle. You need to be comfortable in guiding us to a look that you want. That might involve saying you weren’t keen on something we did. But we’re not ‘one look wonders’ either. So if you’re not too keen on something, just say so. It’s makeup, it can be taken off and it can be changed. So honesty from clients is very important to us. We can’t do our job without it. Like I said earlier, our job satisfaction comes from making others feel good so we naturally want to do the best for our clients and work with you in creating what you want. What’s your favourite product for brides that is always in your make-up kit? This is a difficult question! My kit always has Estee Lauder Double Wear and Estee Lauder Advanced Night Repair serum in it. That way I know I can achieve hydration and a base that will last all day. Helena has a brilliant Instagram account is always posting tips and recommending brilliant products so follow her here and find out about her services on her website.